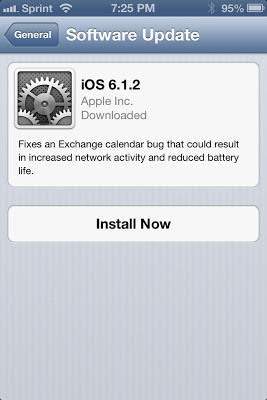 Yesterday, Apple rolled out iOS 6.1.2. This updated is intended to address the Microsoft Exchange bug that has been well documented. Unlike previous iOS 6.1.x updates, iOS 6.1.2 is available for current model iPhone, iPad, iPad mini, and iPod touch models. I've read conflicting reports on whether or not iOS 6.1.2 addresses the lock screen bypass bug. I'll have to test to see if the issue was resolved after applying iOS 6.1.2.